Michael's mother was always supportive of his path in music. She loved music, and her instrument was her voice, though she never sought a career in singing. When important musical things came along, she made sure Michael knew about them. For instance, when The Who's TOMMY was broadcast, Michael's mother fetched him. "This is good, you should watch it," she told him. Even when he was a teenager, Michael's mother would endure the hours of learning and practicing with a smile of tolerance. Her role wasn't always expressly active, but she never once discouraged him in his efforts. If Michael had the passion for something, she wasn't going to interfere with it. It's a lesson all mothers, fathers, and mentors should take to heart. Let them grow, let them learn, let them succeed, let them fail, let then be who they are. 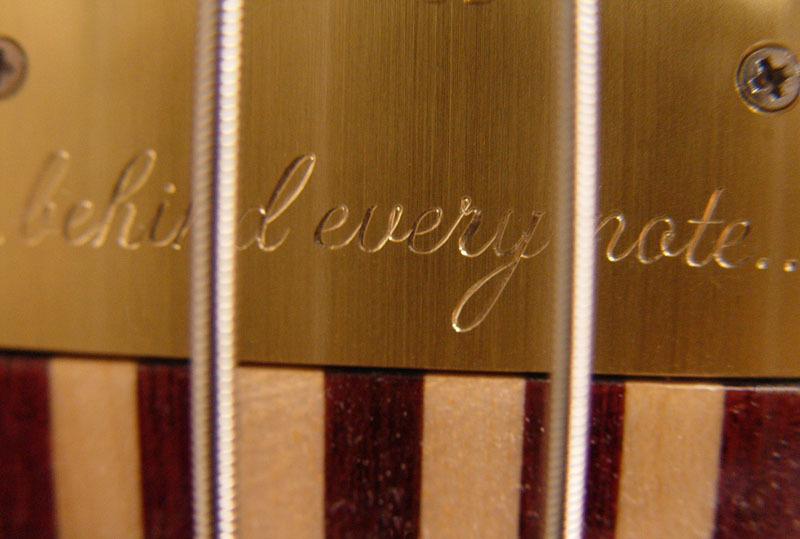 "...behind every note..." is engraved on the truss rod cover, and is a representation of what Michael feels every time he makes music. His mother's love is behind every note. When he first contacted me in the fall of 2008 to commission this bass, Michael told me many wonderful things about his mother. We also discussed the music he was making, and about his love for teaching. 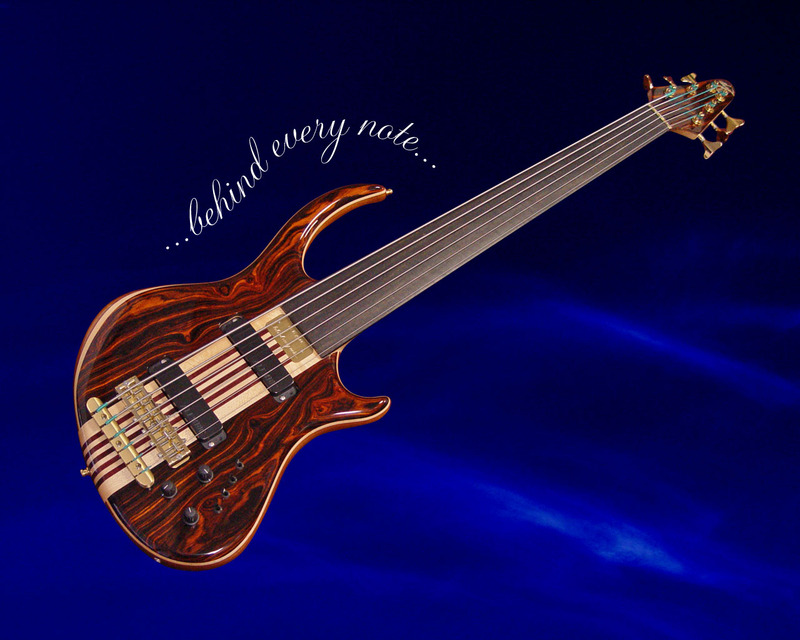 In fact, we had to design this bass over several phone calls and emails, since he would usually tell me, "Sorry, I have to go, my next student is here." He always sounded as excited about teaching as he did when we were hashing out the specifications. 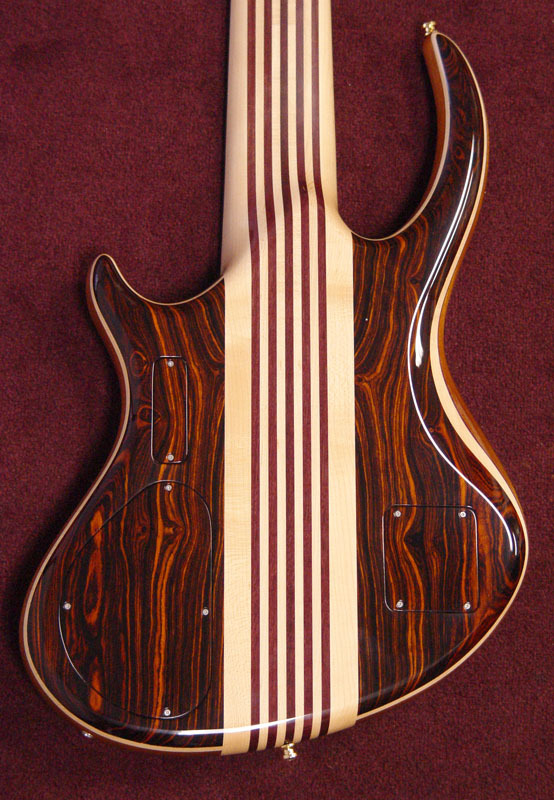 He knew he wanted a 6-string fretless, but then we had to get those pesky details in place. 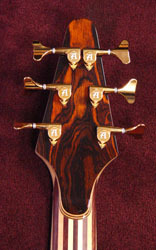 First off, his desire for versatility of tone lead us to the Coco Bolo top and back. Lucky for him, we just sliced up a hearty batch of the good stuff, and he selected these amazing pieces for "ben." 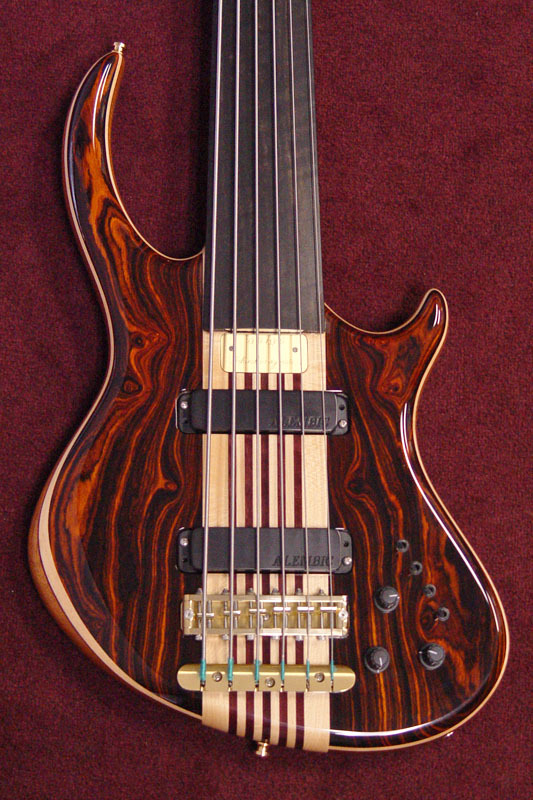 Since the top and back wood were so distinctive, there's no way we could use commercially made veneers, it just wouldn't do. So we made our own veneers by slicing off a thin sheet on the big band saw, then sanding it down thinner yet. 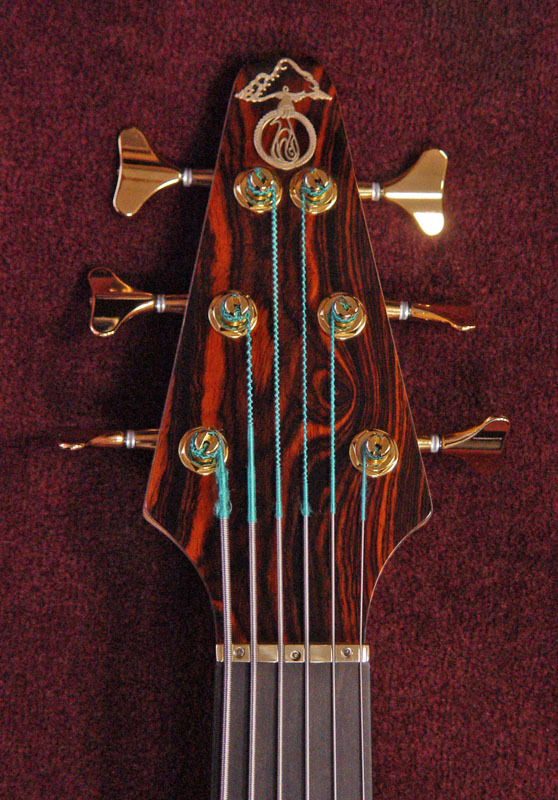 It was amazing how this bass came together so easily - it just sailed through our shop. 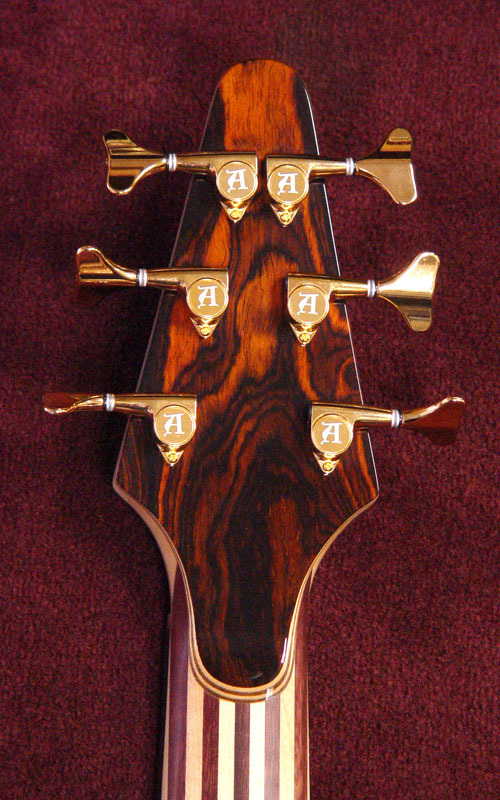 The wood wasn't tempermental, the finish cooperated, it's as Michael said, "like I was being smiled down upon for going forward with it." 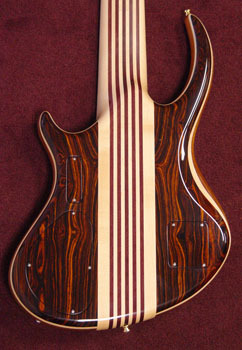 Sure, the Ebony fingerboard is a beautiful black swath of wooden goodness. Though it was hard to photograph, this particular piece had a distinctive curly or "flame" figuring pattern. Just amazing in person. 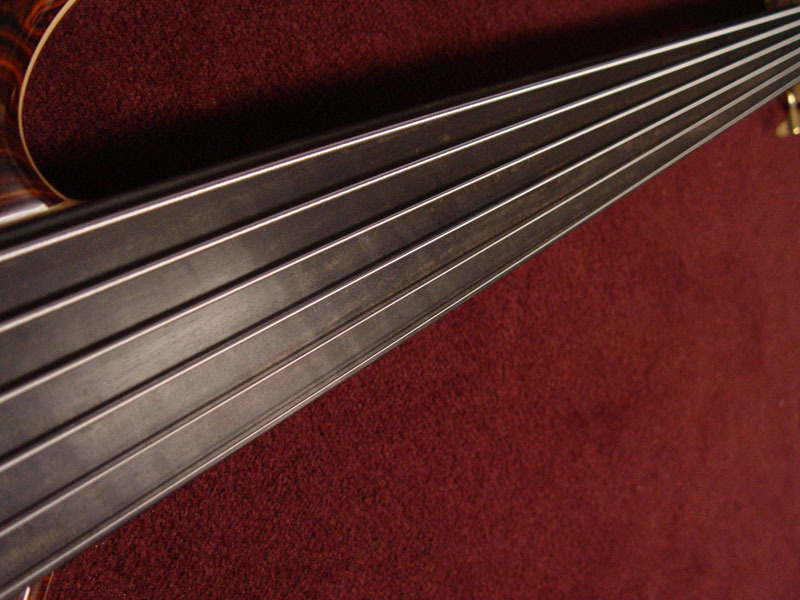 Chosen for it's durability and versatility of tone, there's nothing that sounds like the gleam of Ebony for fretless. Glissando here we come! 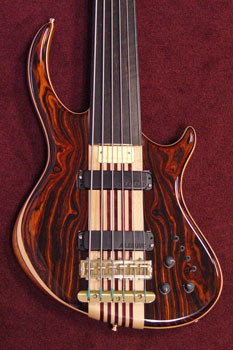 Backplates are a necessity for electric basses, but that doesn't mean they have to be an obvious feature of the back. 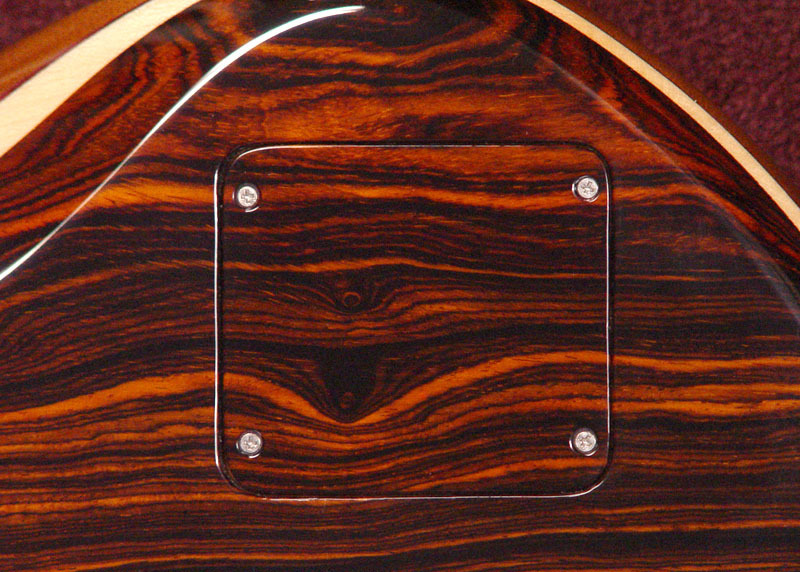 Here we've made continuous wood backplates, so not an inch of this fantastic wood is wasted. These good looks can inspire. "Every time I open the case," Michael relayed "everything and everyone around me just seems beautiful, attitudes, moods, sounds." The side LEDs on Michael's bass are blue. Each one is inlaid in a tiny sterling silver circle, so even when they are not illuminated, the position is clearly indicated. 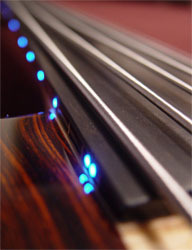 There's always the option to turn them off by way of a mini toggle switch on the front of the bass. 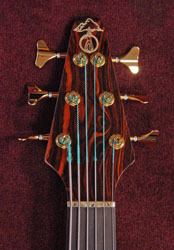 The engraving on the truss rod cover is done in-house. We used to just go to the mall and have the trophy shop engrave with their automated machines, but we decided to take up hand engraving so we could offer designs and fonts that are not part of those automated rotary engraving systems. 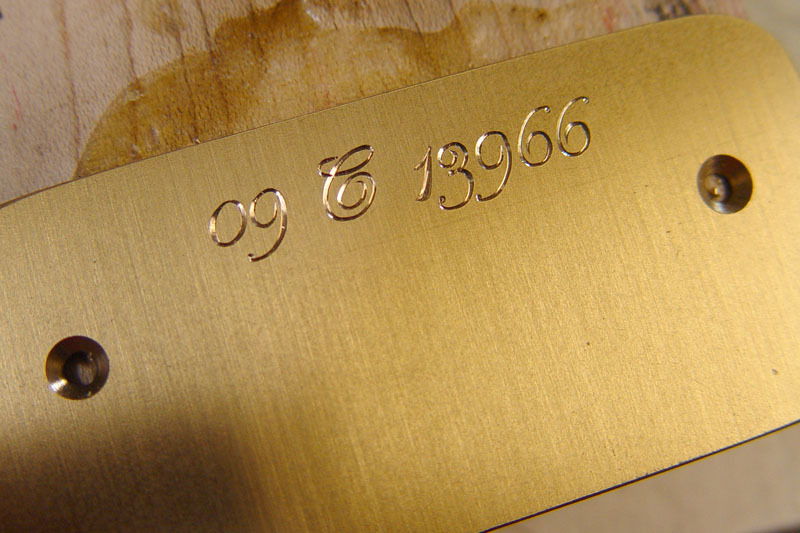 We use a push-graver, and get a nice deep bevel cut in brass. 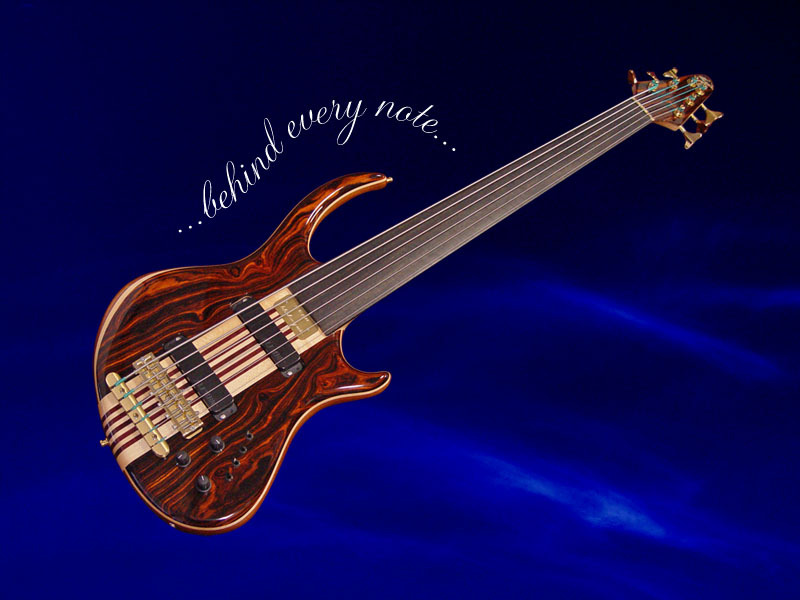 This picture shows where James had just finished the serial number portion, before he started on the "...behind every note.." inscription. A human hand is needed to impart the emotion, else they are just scratches on metal. When you participate in building a memorial to a loved one, it makes your heart grow bigger. You get to know them through the project, and it gets a new life of its own. 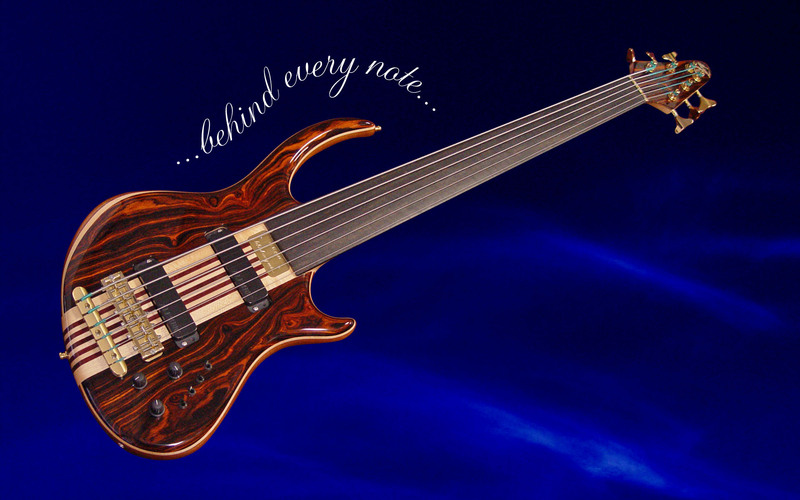 So while we know from Michael that he's deeply pleased with the bass, it is we that are grateful for his invitation. Text and Photographs by Mica Wickersham Thomas © 2009 Alembic, Inc.